Sailors, as a rule, don’t always take kindly to powerboats. When the time came for a couple of lifelong sailors — cruisers and bluewater racers, at that — to make the switch, they had their misgivings. 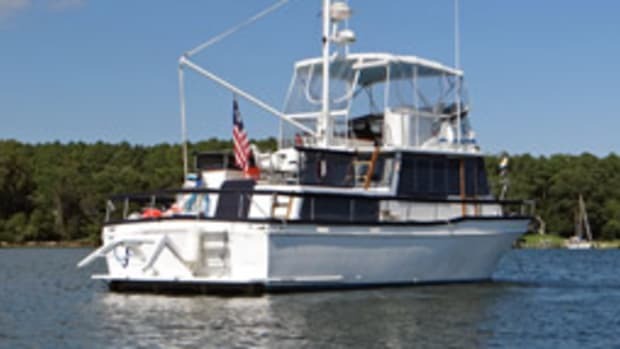 It turns out that Essex, Conn., residents Jack and Ann Young couldn’t be happier with the 42-foot trawler they found five seasons ago in a shed in Maine. It’s kept them cruising — from Maine to Nantucket, Cuttyhunk to the Connecticut River — and kept them doing what they love to do: getting out on the water. They sold the 36-footer in 10 days and bought Storm Runner for around $185,000. They took a shakedown cruise to Robinhood, Maine, and then brought her home. Since then, they’ve cruised from Block Island (R.I) Sound to the shores of Nantucket, Mass., and many points between. They spend a month on the boat every August, calling at such favorite Northeast ports as Cuttyhunk, Martha’s Vineyard, Narragansett Bay and Newport. Along the way, Storm Runner has proven herself every inch a comfortable, capable cruising vessel. The original 135-hp John Deere diesels propel the 42 at 8 knots, together burning a total of 5 gallons an hour. “We are very happy with them,” says Young. 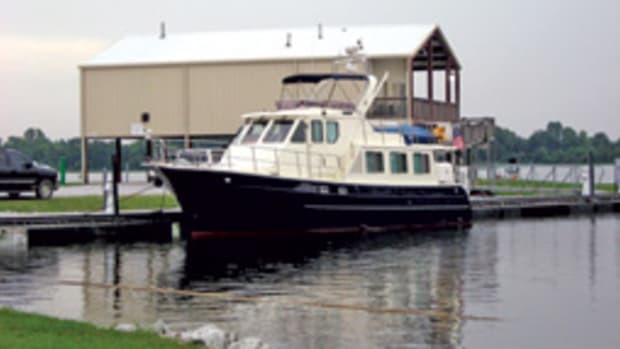 The layout includes a guest cabin forward with a V-berth and a master cabin aft with its own head compartment (including a tub) and a private companionway to the cockpit — a “wonderful space,” she adds. There’s an old-fashioned butterfly hatch forward, and the 14-karat gold dome lights in the cabin are there because they don’t corrode. “Each year, Jack says we can’t spend any more; we can’t possibly spend any more — and we do,” says Young. They also spend time on their boat, though, and it’s quality time. There’s a mooring to catch in Hamburg Cove for a summer dinner, or the Essex waterfront, where the boat is docked, to enjoy around sunset. 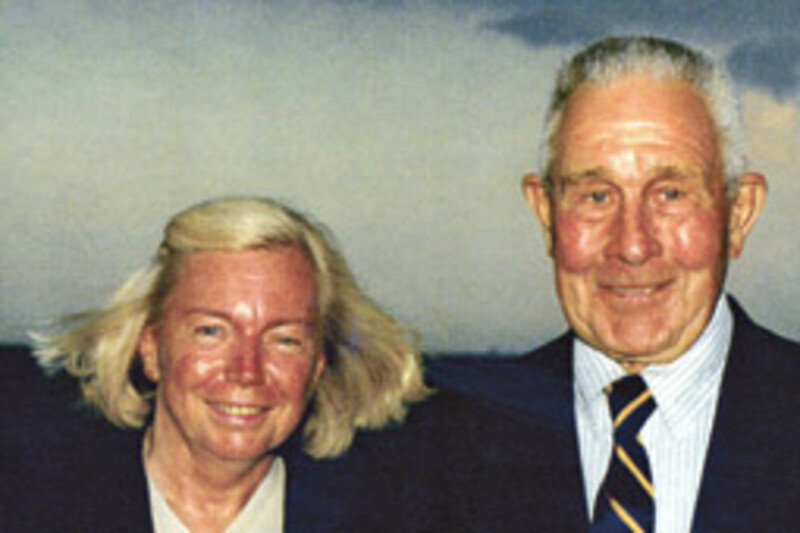 “I’ve always lived on or very near the water, and I don’t anymore, and I miss it,” she says. “So we come down and have evening cocktails on board. The Grand Banks 42 profile changed little during its 30-year production run. 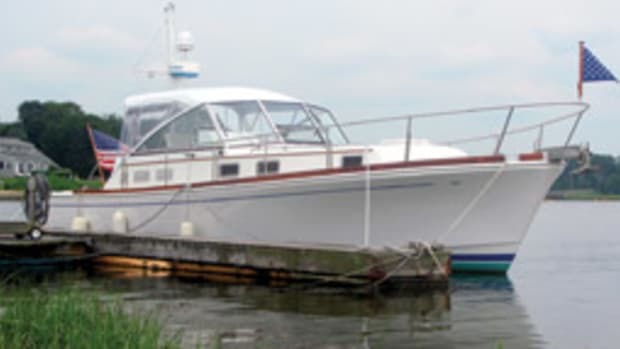 Discontinued in 2004, her tall bow, broken sheer and distinctive pilothouse topped by a flybridge look much as they always have. 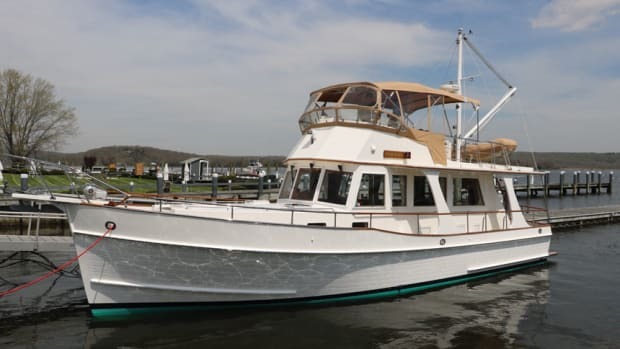 Other notable features include deep side decks and protective bulwarks, three-panel windshield, wide side windows, wheelhouse side door, and steadying-sail mast. Standard power comes from a pair of diesels; the early models had smaller twin 135-hp engines for an economical 9- to 10-mph cruising speed. Later, bigger engines, such as the 375-hp Caterpillar, pushed the cruising speed to 15 to 17 mph. 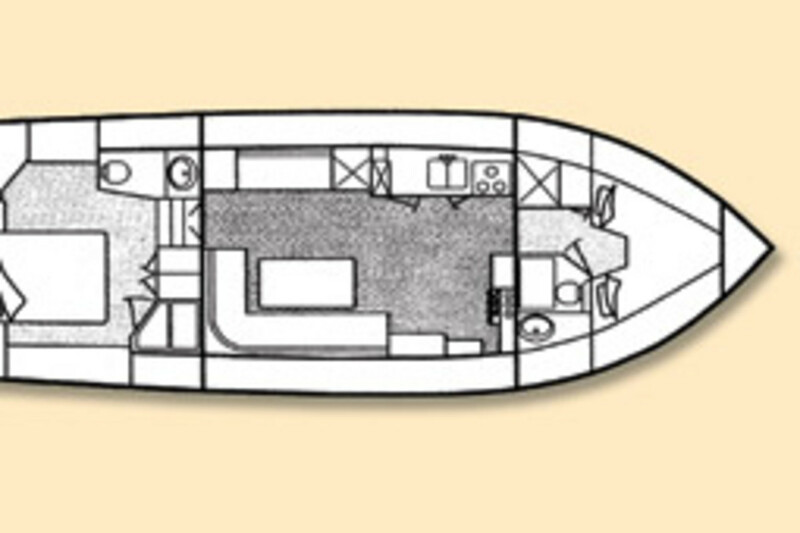 Several layouts were offered through the years, and most had a V-berth forward; pilothouse saloon with a steering station, a spacious galley to port and an L-shaped lounge/dinette to starboard; and a master cabin aft with its own adjacent head compartment with shower and, in some boats, a tub. 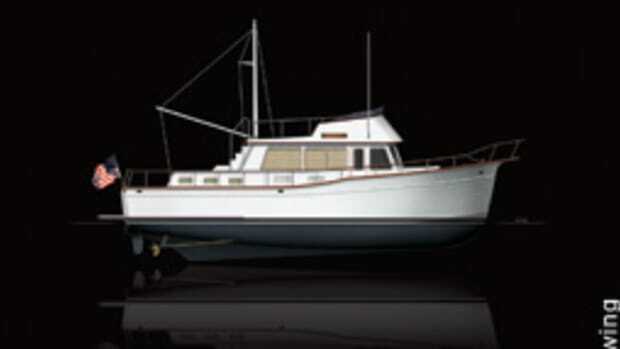 The Grand Banks 42 can be found all over the United States, and models from the 1970s are priced up to around $165,000. For 1980s models, pricing starts around $240,000. Boats from the 1990s are in the $300,000 to $400,000 range, and later models cost upwards of $500,000. 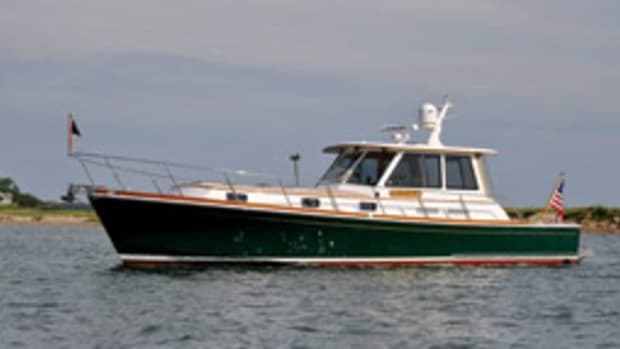 With more than 1,500 built, the Grand Banks 42 was one of the most successful designs ever produced. 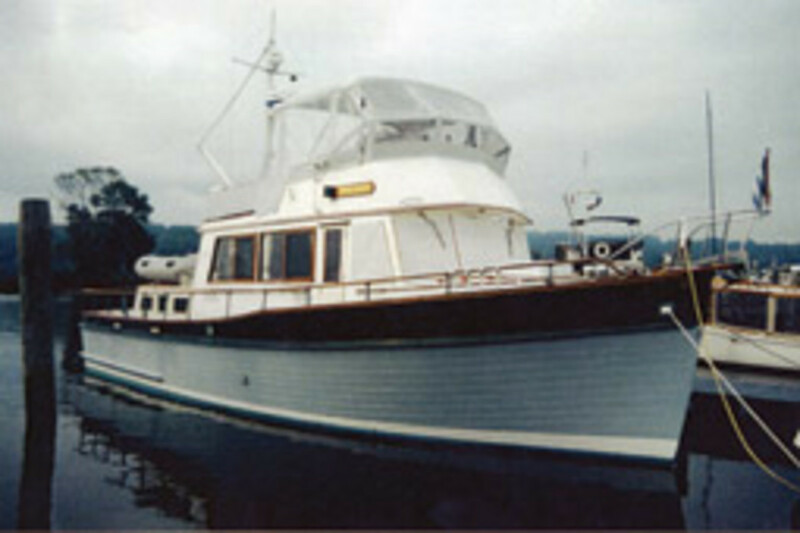 It first appeared in the 1960s as a wooden boat and made a successful transition to fiberglass in the early 1970s. 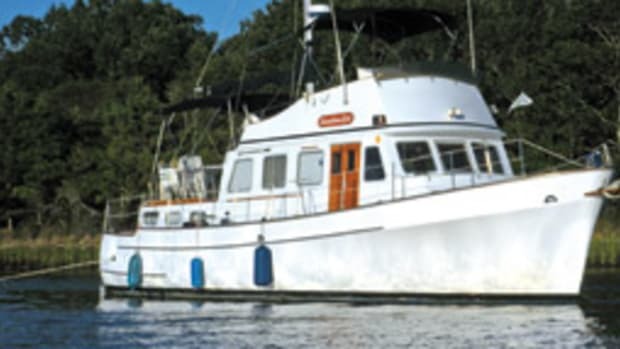 Notable for its salty appearance, the 42’s seaworthiness and spacious upper-end accommodations made them popular with cruisers and former sailors. It was slightly altered during its four-decade production run, lengthened and widened a few inches to allow for a larger galley and saloon. 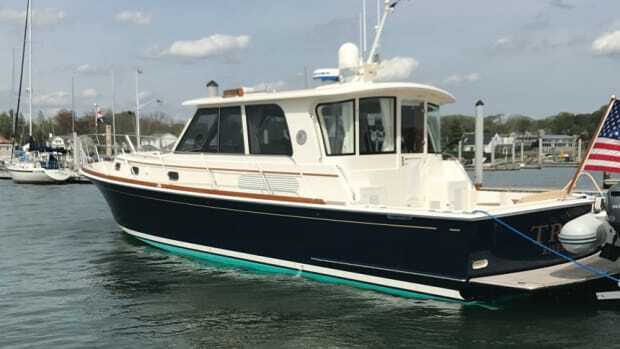 Today, Grand Banks builds boats in three models: Heritage trawlers from 41 to 52 feet, Eastbay cruisers from 39 to 55 feet, and Aleutian long-range cruisers from 59 to 72 feet. BUILDER: Grand Banks Yachts, Seattle. This article originally appeared in the June 2009 issue. When a couple has logged a lifetime’s worth of boating, they know what they want out of the lifestyle; they know how to be comfortable in, and on, the boat of their choice.